If you want a beautiful bermuda or zoysia lawn this summer, you need to “scalp” it this spring. Normally, people think of “scalping” a lawn as something bad that happens when your mower blades are dull, set too low, or when you have uneven terrain causing the mower to bottom out and take off the entire plant. The same things that make scalping bad in the middle of the summer (taking the entire plant off) is what makes it essential in spring maintenance. Check out the photo above. 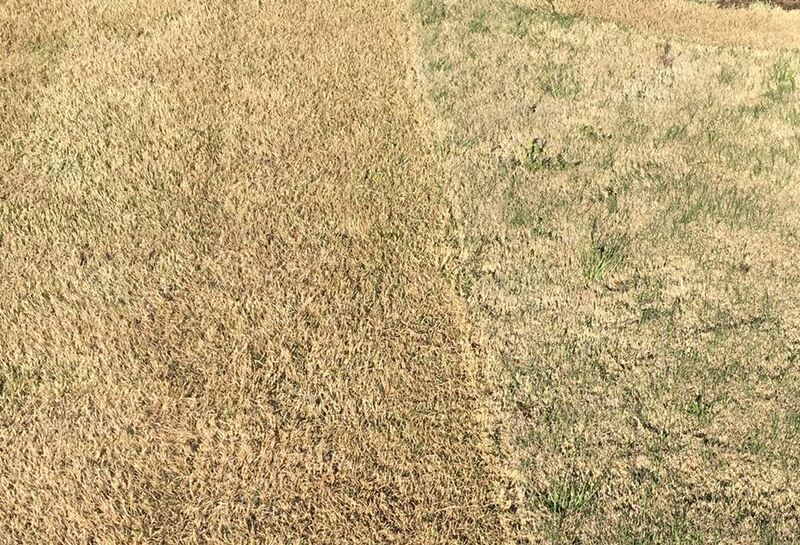 Your lawn probably looks like the right half of the photo. Crank your mower down to the lowest possible setting and mow the whole thing so it looks like the left side of the photo. Bag the clippings and get rid of them. Yes, this will take a long time, and you’ll need to figure out what to do with likely dozens of bags of yard waste, but it’s worth it. Tempting as it may be, don’t use a mulch setting…that’s for later in the year and it would defeat the purpose of all the hard work you’re doing to scalp. You want this organic material GONE! This guidance applies ONLY to bermuda, zoysia, and hybrid varieties of warm-weather grasses. This does NOT apply to fescue, rye, blue, and other varieties of cool-weather grasses. If you scalp those, you’ve likely killed them. Scalping bermuda cleans up dormant turf and gets that extra material off of your lawn so it can’t form a thatch layer or impede growth of new grass. It also exposes the soil to more sunlight and warmth, helping to promote earlier growth and green-up. When bermuda grass turns green, it’s because new plants have come in, it’s not a transformation of the existing dormant stalks. They are completely replaced. Scalping helps get them out of the way more quickly. Don’t scalp too early. The danger of a freeze must be behind you, otherwise those delicate new plants that you’ve worked so hard to coax out of the ground will be damaged if the temperatures dip. Late March through April is a fairly safe bet in North Carolina. After scalping, plan to mow every week or two as the grass comes in, which will promote healthy horizontal growth that fills bare areas and won't brown when you mow it low later in the year. Older PostWhat Is a French Drain?